These concours outer bumper braces are exact reproductions of the original components installed on 69-70 Mustangs. They were developed using original Ford blueprints and NOS samples to match every detail exactly. Each piece is manufactured on new Scott Drake fixtures for a perfect fit. Unlike other reproductions that require grinding, drilling and bending, these are made to install without modification. Tube angles, mounting plates and bolt holes are precisely set. Bolt holes are slightly oversized to accommodate original and most reproduction bumpers. 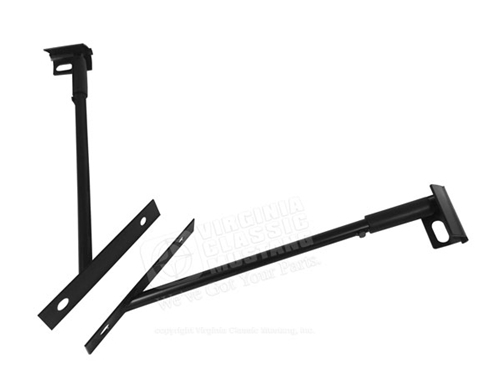 These bumper supports are sold in pairs and finished in a semi-gloss black paint. Note: braces include rubber isolator pads and feature metal tabs just like the original parts.